This Bactrack s35 is one of the smallest breathalyzers available in the market. It makes use of the proprietary sensing technology and a specially tuned algorithm for assessing the BAC (Blood Alcohol Content) in a simple way. Things included: Bactrack s35, three mouthpieces, instruction manual and one year warranty. Ultra-Portable design – Backtrack s35 comes in a small, compact design which can perfectly fit in the palm of your hand. Equally, can be stored in a purse or pocket. Gives accurate BAC results – Usage of Proprietary Advanced Microcheck Sensor Technology yields reliable, accurate BAC results (from 0.00-0.40%). LCD Screen – The BAC results are shown on a bright blue, easy to read two digit LCD display. One-touch Operation – Just power on the device and it will begin testing in seconds. Fulfills all the standards of an FDA (501K approved) alcohol screening device. Overall, the product has received 3.2 stars out of 5 stars. This is an affordable breath alcohol testing device. It’s sleek and portable design are loved by most of the users. They are happy with the results and have given very positive reviews for this product. Mentioned below are some honest reviews for your reference. This can help you in making a right choice regarding this item. Let’s have a look at some. Backtrack s75 is designed for maximum comfort and ease of use. It features Xtend Fuel Cell Sensor technology. It has been tested by FDA and meets all the requirements of the DOT/NHTSA for a breath alcohol screening device. Alternatively, the Backtrack s75 is well suited for both professional and personal use. The miniature internal air pump lets the collection of more precise breath samples. Things included: Bactrack s75, carrying case, six mouthpieces, two AAA batteries, instruction manual, including one year warranty. Xtend Fuel Cell Sensor Technology – This Bactrack s75 uses a proprietary platinum-based Xtend Fuel Cell Sensors for yielding the accurate BAC results. The Technology is much trusted in the hospitals, clinics and in law enforcement. Police Grade accuracy – It quickly and easily counts your blood alcohol content (from 0.000 – 0.400% BAC) with the police-grade accuracy. Optimal Breath Capture – The s75 includes a solenoid air pump to test air pump from the deep lungs. Advanced user controls – Includes easily change units of measurements along with user–defined BAC thresholds for testing. DOT/NHTSA Tested and Complaint – It meets the federal requirements of the Department of Transportation and National Highway and Traffic Safety Administration for alcohol screening device. One Touch Operation – Power your Bactrack s75 and begin the testing in seconds. Crisp 4 digit LCD display. Backtrack s75 is a perfect combination of accuracy, style, and affordability. Works great, according to me! Where to buy Bactrack s35 and Bactrack s75? Both the products are available for sale online both at breathalyzer.net and at amazon.com. They are available at a much cheaper rate with certain discount and coupon offers. Further, you may also visit the concerned website for more information. 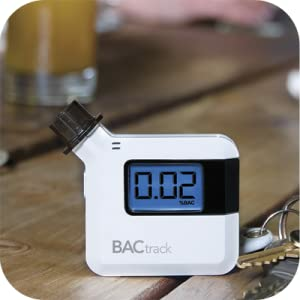 Breathalyzer offers $10 – $50 on all the Bactrack products, $10 on orders over $100 + free shipping, $5 on orders over $50 + free shipping, $20 off on any order, free shipping sitewide. Alternatively, you may login with your email address for getting updates on all the latest deals and offers. How to recalibrate the Backtracks? To recalibrate, you may send the devices to the company’s website. How to clean the mouthpiece, If I wish to reuse them? You may clean the mouthpiece with a warm soapy water and rinse or wash them in a dishwasher. What is the contact number of Breathalyzer? The contact number is 1-877-334-6876. Their working hours are from 9.00 am – 6.00 pm. There is a 30 days return policy offered by this site on every purchase.